… for the End of unjust Rule! Unterdrückung in Südafrika. Wie lange noch?  *Allan Aubrey Boesak turned 70 on 23 February 2016. This is a preliminary version of an essay written in view of that occasion (with foot-notes). We wish Allan Boesak a long life! Men and women from various solidarity-groups in West Germany gathered at a road-crossing in Düsseldorf during the “Kirchentag” in June 1985, to pray in solidarity with the peoples of South Africa and Namibia for “the end of unjust rule” – the end of apartheid. They were responding to reports about the escalation of oppression in South Africa and Namibia and were seeking to raise awareness in their country for the need to support the struggle for liberation in southern Africa. What initially was to be a solemn expression of “togetherness before the creator of heaven and earth – the ruler of the universe” in quest for justice, developed into a public venture in confessing faith and posed a challenge to pledge solidarity more effectively. Prospective participants had started well ahead of the Kirchentag exchanging opinions and perceptions with regard to the theme of the proposed prayer. This grew into a debate that soon involved wider circles in different parts of the country over a lengthy period. Questions and statements in that debate called to mind that the apartheid-regime was, in fact, a state that had neither been instituted nor authorized by the peoples it had ultimately subjugated under its rule. The discussion reflected on contemporary concepts of government and types of societies in and around southern Africa and western Europe, comparing models of government stretching as far back as beyond the Age of Enlightenment in Europe . The statements and arguments in those debates expressed ethical and legal insights into conditions, situations and premises of protest, resistance and overthrow of rule in recent history focusing on apartheid and the liberation-movement in Southern Africa. The essay at hand, reflecting on the controversy around `the Prayer for the end of unjust rule – the end of apartheid´ in 1985 and the commitment of the solidarity-movement in West Germany in a network of exchange between them and individuals and groups in South Africa and Namibia in the early 1980s, recalls the main arguments in that controversy, highlights certain insights and deliberates on the meaningfulness and the implications of that venture for theology and church-politics in and around South Africa. Most of the round 200 adults and youth who had followed the invitation and were gathered initially in the open space around the fountain at the Melanchthon Protestant Church-Congregation in Düsseldorf and had moved later to the intersection of the Graf-Recke and the Simrock Streets nearby on Thursday, 6 June 1985, had been attending the Discussion-Session on the Kirchentag entitled “… Wer Unrecht sät, ernet Widerstand (Südafrikatag)” [“… Injustice solicits Resistance (A Day on South Africa)”] on the Kirchentag that morning. They had come from different parts of West Germany and most of them were meeting for the first time. After the prayer a half-an-hour later, they each resumed their respective undertakings and pursuits on the Kirchentag which went on till Sunday, 9 June. The public discussion and the debates about their prayer continued and gained momentum after the Kirchentag; engulfing diverse interest-groups, they endured for several months. A brief account of the incidents preceding the Prayer as well as a survey of some factors underlying the controversy in the public discussion on “[whether and how …] solidarity against apartheid” in West Germany could and should be pledged, shall be given. To conclude, I shall render a reflective summary as a contribution to the ongoing theological discussion on “resistance and solidarity against unjust rule”. I start by asking: What had happened and what was happening in Southern Africa (– and in Western Europe) in 1985? “Apartheid in South Africa. What does that have to do with us (in Western Europe)?” is one of the rhetorical questions that used to be discussed at length and not without controversy in local and regional interest-groups countrywide involving political refugees and visitors from South Africa and Namibia particularly since the Soweto Uprising . The ideological and material support of the apartheid-regime resulting from the political and economic ties between the governments of the two countries, West Germany and South Africa, was identified as the main hindrance to the ongoing endeavours by the peoples of South Africa and Namibia to resolve the inherited conflicts, overcome apartheid and advance to democracy in their countries. As part of a worldwide community of believers in the discipleship of Jesus Christ, persons and groups on the Kirchentag that sought to reaffirm their rejection of apartheid and to pledge their support for the cause of justice against apartheid more effectively, referred to the initiatives of pledging solidarity in the times when individuals and groups had questioned and resisted the ideology and the praxis of Nationalsozialismus [Nazism] in the history of their own country between 1933 and 1945. This motivated them to continue preparing for a common prayer for the end of unjust rule – the end of apartheid – and to respond to the call from the townships and elsewhere to refrain from supporting the apartheid-regime. Predictably, the programme of the Kirchentag in 1985 entailed a variety of topics ranging from bible-study over audio-visual presentation up to podium-discussions around the theme of unjust rule in South Africa and Namibia, apartheid. The average participant had read and heard of apartheid and the ensuing protests and resistance in the “townships” and elsewhere at the latest since the “Soweto Uprising” in 1976. The murder of Steve Biko in detention in 1977 and the “banning” a few weeks later of persons and yet another 19 organisations and newspapers opposing and resisting apartheid were coupled with continued raids and detentions-without-trial that sought to silence certain individuals and to destabilise particular institutions including the South African Council of Churches (SACC) and some of its member-churches and staff-members. These and other measures of repression were continually being recorded and brought to the attention of the public in Western Europe by the anti-apartheid solidarity-movement. The escalation had led to a steady increase in the number of persons and groups also in West Germany – anti-apartheid solidarity-groups – that had eventually become aware of the ongoing oppression and were reacting by participating in ongoing ventures of the anti-apartheid solidarity-movement, exchanging perceptions on issues of justice, oppression, resistance and solidarity with regard to “undemocratic rule” in southern Africa. By 1982 the solidarity-movement in West Germany was consolidating and intensifying their efforts to motivate the general public to support the initiatives of protest and resistance against apartheid, when protest escalated in the “townships” and elsewhere as the apartheid-regime set out to rewrite its constitution in order to entrench more effectively the exclusion of the African population from citizenship and political rights outside the former `native- and mission-reserves´ that had been declared their “homelands” – a measure the apartheid-regime euphonically named “power-sharing” . The programme of the Kirchentag had over the years repeatedly reflected the dynamics of `communication and exchange at grassroots-level´ between and within groups challenging and resisting apartheid in southern Africa and western Europe. The discussion-forum „Wer Unrecht sät, ernet Widerstand (Südafrikatag)” [“… Injustice solicits Resistance (A Day on South Africa)”] in 1985 stood in that tradition and was, as was to expect, well attended. Among those in the townships and elsewhere who were rejecting the subjugation and exploitation in the 1980s, were persons and groups who, as “Christians”, had started coming together on a more or less regular basis in various communities in different parts of the country as neighbours, friends or colleagues for purposes of exchanging experiences (ukuxoxelana [conversing]) and simply `praying for the end of unjust rule´ ` [ukukhulekela ukuqedwa kombuso wobudlova]´. These included individuals and institutions, some of whom were member-churches of the SACC. Rejection of the “tricameral parliament”-programme had become the main theme. Faith-communities and congregations in the townships and elsewhere including member-churches of the SACC were responding to the escalation of atrocities in a variety of spontaneous activities and long-term projects. Coming together to condemn unjust rule and to re-affirm their stand for justice had become a ritual that enabled neighbourhoods and interest-groups – living under the rules and conditions of segregation and subjugation – to meet, demonstrate and articulate their condemnation openly despite the risk to be detained or silenced by the state-authorities. The active involvement of persons and interest-groups from southern Africa in some solidarity-groups in West Germany that were represented on the Kirchentag in 1985 enhanced communication and expedited exchange of perceptions with persons and interest-groups in the townships and `homelands´ remarkably. Such direct contacts and continuous exchange helped update reports about developments in exile and particularly with regard to “the armed struggle” , which, indeed, was very essential. The apartheid-regime had in the meantime resorted to a diplomatic offensive towards certain outspoken critics including representatives of the liberation-movement and the political scene in Western Europe and North America. This was a strategy to undermine the efforts and to thwart the resistance against apartheid and was condemned by civil society and opinion-leaders in no uncertain terms. Between the morning- and the afternoon-sessions of the Kirchentag-programme entitled “Wer Unrecht sät, ernet Widerstand (Südafrikatag)” [“=… Those Doing Injustice Earn Resistance (A Day on South Africa)”] on Thursday, 6 June, interested persons were to meet to say the “Lord’s Prayer”, pleading for the end of unjust rule – the end of apartheid. This reminded of prayer-meetings in “townships” and elsewhere. Articulating their concern simply in the words of the “Lord’s Prayer” had been debated and ultimately agreed upon as being `fitting and just´ in the given situation. In their deliberations, the prospective participants had discussed “the Lord’s Prayer” intensively and subsequently reaffirmed it as `the earliest and the most durable moment of brotherhood and sisterhood in the discipleship to Christ which remained common-ground beyond whatever threat to or violation of human dignity´. The phrase “Thine is the Power” in the conclusion of “the Lord’s prayer” had been proposed as theme of an impulse that could be given before the prayer. By referring to narratives over incidents of `praying for the end of injustice´ in the Old and the New Testaments as well as in the history of the community of believers in the discipleship of Jesus Christ, “the Church”, those who had conceived the idea of the Invitation to Prayer had sought to underline the intended congruence between the forthcoming Prayer and the traditions of belief and confession that had gained recognition in the history of the community of believers in the discipleship of Jesus Christ, “the Church”, especially in the recent past in the pursuit of the Bekennende Kirche, the Confessing Church, against unjust rule in Germany prior to World-War II [1933-1945] and in the Theology of Liberation in southern Africa and elsewhere. Protagonists on either side had been co-authors of the Invitation and were reaching out, canvassing for more support for their respective proposals. Whereas the former saw the need to intersect in the interests of the rulers and plead for their deliverance (from continuing trespassing against `the Will of the Creator´), the latter contended that a good example in living according to `the Will of the Creator´ had to be set, calling on the protagonists themselves to take the lead. The ones soon got termed “the prophets pleading for God’s mercy”, the others “the preachers calling for repentance and confession.” The `prophets´ had “them”, the rulers, in view, whereas the `preachers´ focused on “us”, the prayers themselves. Reactions from parts of the public that had up to then been indifferent to or were practically sympathizing or even cooperating with the apartheid-regime, included statements, suggestions and questions that either rejected the very notion of `praying for change in political matters´ altogether, or argued for unconditional approval of the prevailing state of affairs as explication of law and order in line with the teachings of “Christian faith”. Quoting from the New Testament, Romans chapter 13, those opting for unconditional loyalty to and support of whoever were in power [be they the apartheid-regime itself], rejected any notion of criticizing or even resisting any measure of state-authority, claiming that such practices were contrary to biblical teaching. Christians would rather suffer persecution and even martyrdom than disobey or challenge state-authority however unjust the latter might be perceived. Individuals and groups as well as representatives of church-institutions and mission-societies with connections to South Africa and Namibia joined the discussion. Their options largely and very often resembled those of the groups that were actually sympathizing or cooperating with the apartheid-regime in so far as they would not openly reject the invitation to pray for change, they would, however, insist that “spiritual” change ‘which concerned everyone [not only those identified as wrong-doers in particular]’ was meant. Praying for the end of unjust rule would be comparable to consenting to arbitrary take-over of state-authority by whosoever chose to do so, and was therefore a willful act in favour of and in the interests of a prospective ruler who might turn out to be at least just as unjust as the current one. It would, for that reason, be `presumptuous and at least culpable´ to even imagine having to pray for the end of government or state-authority. Many, of course, stayed aloof from the whole controversy; others merely expressed their critique over an exercise they regarded as first and foremost concerned with catering for the supposed correctness of particular points of view rather than rendering `tangible support´ and being part of the pursuit to end unjust rule. `Solidarity, not lip-service!´ became one of the slogans. “Our invitation to prayer is a rather moderate response to the messages, reports and pleas reaching us from South Africa and Namibia. Those from South Africa and Namibia participating in the prayer-gathering helped deepen the feeling of togetherness and widened the horizon by giving reports, answering questions and giving comments on certain headlines – an invaluable contribution, indeed. Predictably, absent on the scene were the notoriously vociferous individuals and groups whose sympathies for and support of the apartheid-regime had over a lengthy period become so unrelenting that they were of late even threatening to withdraw their formal membership of the Church and, as a result, stop paying church-tax, if the Invitation to Prayer were not withdrawn and if the Prayer would be held at all – a calculated threat that had occasionally, in fact, managed to exert the required amount of pressure to coerce decisions to their advantage. “`Amen´ marks the end of a prayer and is the first step towards the questions and challenges preceding the possibly next prayer”. None of the participants had anticipated anything else. Dispersing to resume the various undertakings awaiting them that afternoon, they each had gained yet an experience in getting together and in sharing hope in view of the injustice and the atrocities that had in the first place made them want to come to pray together. Unjust rule had not suddenly ceased to prevail. Powerlessness and helplessness were admitted by many at the scene; that state of affairs was, however, no longer generally perceived as unchangeable or insurmountable. In pronouncing “the Lord’s Prayer” in togetherness with “brothers and sisters here and elsewhere” the participants had affirmed their reliance on the power they deemed greater than that of any ruler and did thereby not have to specifically mention even the apartheid-regime at all. The act of reciting the well-known prayer together turned out to be more than a mere performance; togetherness and interconnectedness in the anticipation of a common future for all beyond any segregation or subjugation whatsoever – the common future beyond apartheid – was experienced directly and could be communicated effectively. Reactions on the scene, countrywide and abroad affirmed the intention of the venture and ignited the exchange of arguments and perceptions on whether and how one could or should “as a Christian” respond to injustice in one’s midst – indeed, a controversy without end! “We realised at once how much we had in the meantime learned from our brothers and sisters in the townships and elsewhere to stand firm even when we have to fall on our knees and plea. We had in the past years learned from them to live up to the hope within us. In our own language we recited the prayer they have to resort to so often in despair – the Lord’s Prayer. That brought us even closer together and strengthened us – here and over there – for the ongoing pursuit!” one of them resumes. The matter of concern – the longing and the plea for “the end of unjust rule” – reassumed its place in that `prayer of prayers´, “the Lord’s Prayer”, not least thanks to the accompanying controversy and its aftermath. Future generations certainly shall acknowledge and cherish that experience accordingly and hopefully draw lessons from it for the pursuits in their times. Ben Khumalo-Seegelken, Theologian, Social-Scientist and Human-Rights’ Activist, works in a variety of civil-rights’ networks both in South Africa and in Germany. Recent publication: “The Christian Institute of Southern Africa In Interaction with the Churches and Civil Society”. Boesak, Allan: Gerechtigkeit erhöht ein Volk, Neukirchen-Vluyn 1985. DEUTSCHER EVANGELISCHER KIRCHENTAG DÜSSELDORF 1985, Dokumente, Herausgegeben im Auftrag des Deutschen Evangelischen Kirchentages von Konrad von Bonin, Stuttgart: Kreuz-Verlag 1985, ISBN 3 7831 0803 9 (pp. 868). Evangelisches Missionswerk im Bereich der Bundesrepublik Deutschland und Berlin West e.V. (ed. ), “Zum Schweigen verurteilt. In Südafrika gebannt”, [Hamburg 1978], (pp. 103). Kistner, Wolfram: Report on the Cluster Justice and Society presented to the National Conference of the South African Council of Churches, Braamfontein 1982, (unpublished). “Kündigt das Kulturabkommen mit Südafrika!” Broschüre des Komitees für die Kündigung des Kulturabkommens Bundesrepublik Deutschland – Südafrika, Bonn | Frankfurt a.M. 1984, pp. 48. Race Relations Survey 1984, Johannesburg: South African Institute of Race Relations [SAIRR] 1985, ISBN 0-86982-307-8, (pp. 991). Race Relations Survey 1985, Johannesburg: South African Institute of Race Relations [SAIRR] 1985, ISBN 0-86982-272-1, (pp. 645). Stelck, Edda: Politik mit dem Einkaufskorb. Die Boykott-Aktion der evangelischen Frauen gegen Apartheid. Wuppertal: Jugenddienst-Verlag 1980. ISBN 3-7795-73441-5 (pp. 142). The “Kirchentag” is the country-wide bi-annual event of protestant activists engaged in social and political initiatives and projects in Germany [in the current concept] since 1949. In 1985 the “Kirchentag” took place in the city of Düsseldorf, West Germany. “Zum Schweigen verurteilt. In Südafrika gebannt“, [„Condemned to Silence. Banned in South Africa“]; „Südafrika in den achtziger Jahren.“ [„South Africa in the 1980s“], which were information-booklets edited by: Evangelisches Missionswerk im Bereich der Bundesrepublik Deutschland und Berlin West e.V., [Hamburg 1978 | 1983], (pp. 103 | 45). Khumalo, Ben: Düsseldorfer Kirchentag 1985 – Notizen [Notes], (unpublished). The comparative discussion of models of states and societies covered the period up to the times when the Macedonians under Alexander the Great had conquered parts of the Near East from the Persians according to the accounts derived from narrations in biblical literature. The passage of Scripture 1 Chronicles 29 served as regular frame of reference. “Forum: Wer Unrecht sät, ernet Widerstand (Südafrikatag)”, Ruth-Alice von Bismarck, Ben Khumalo, Jürgen Schroer, in: DEUTSCHER EVANGELISCHER KIRCHENTAG DÜSSELDORF 1985, Dokumente, Herausgegeben im Auftrag des Deutschen Evangelischen Kirchentages von Konrad von Bonin, Stuttgart: Kreuz-Verlag 1985, ISBN 3 7831 0803 9, pages 551-554. Altogether 11 guests from South Africa and Namibia were among them. Not all of them were personally known to one another. They each had responded to the more or less spontaneous invitation circulated by an interest-group from Düsseldorf that had met at the Melanchthon Protestant Church-Congregation im May 1985 and had `come together to express solidarity with the peoples of South Africa and Namibia in a prayer for the end of unjust rule – the end of apartheid´. Not many of them were members of a church-congregation; the majority was, however, engaged “as Christians” in matters of solidarity for justice and peace against apartheid and were participating actively in several other gatherings on the programme of the Kirchentag. Women outnumbered men remarkably; young adults between 18 and 30 were in the majority, followed by women between 31 and 50. Party-political affiliation did not matter; most of the participants would, however, most probably vote in opposition to the politics and practices of the parties that were in government, the Christliche Demokratische Union (CDU) and the Freie Demokratische Partei (FDP). Practically each one of them supported and promoted the ongoing boycotts and sanctions-campaigns against apartheid led by the Projektgruppe Frauen für Südafrika [= Project-group Women for South Africa] of the Evangelische Frauenarbeit in Deutschland (EFD) [= Association of Protestant Women in Germany] and the Anti-apartheid Bewegung (AAB) [= Anti-Apartheid Movement]. Last, not least: Each one participated in personal capacity, not representing any organisation or institution. DEUTSCHER EVANGELISCHER KIRCHENTAG DÜSSELDORF 1985. The anti-apartheid campaigns “Kauft keine Früchte der Apartheid!” [„Buy no Fruit of Apartheid!“] and “Kündigt das Kulturabkommen mit Südafrika!” [“Terminate the Cultural-Exchange Agreement with South Africa!”] characterised the public discussion prior to the Prayer. (Stelck, Edda. Politik mit dem Einkaufskorb. Wuppertal 1980; “Kündigt das Kulturabkommen mit Südafrika!” Bonn | Frankfurt a.M. 1984); Hain, Peter. “don’t play with apartheid. the background to the Stop the Seventy Tour Campaign”. London 1971. News-agencies in southern Africa and in Western Europe had been reporting fairly frequently on violent measures by police- and military forces of the apartheid-regime in the “townships”, “homelands” and elsewhere at the latest since the school-boycotts and youth-revolts, the “Soweto Uprising”, in 1976: “During 1984 South Africa experienced the most widespread civil unrest since the Soweto Uprising in 1976. The underlying causes of the unrest were continuing dissatisfaction with `Bantu- education´, anger at the exclusion of Africans from political power, and the persistence of high inflation and deepening unemployment.” (SAIRR 1984, xvii). Lists of names of persons (127) and organisations (22) under “banning-order” or detained on political reasons and without trial (634) since 19 October 1977 had been published amongst others by Evangelisches Missionswerk im Bereich der Bundesrepublik Deutschland und Berlin West e.V. (ed. ), “Zum Schweigen verurteilt. In Südafrika gebannt” [=“Condemned to Silence. Banned in South Africa”], [Hamburg 1978], (pp. 91-98). 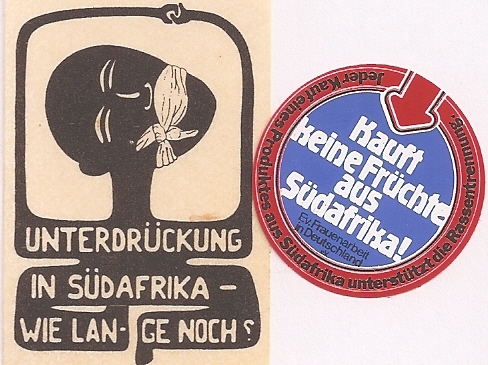 These initiated and promoted anti-apartheid campaigns including “Kauft keine Früchte der Apartheid!” [„Buy no Fruit of Apartheid!“], “Kündigt das Kulturabkommen mit Südafrika!” [“Terminate the Cultural-Exchange Agreement with South Africa!”] and “don’t play with apartheid!”. The “reform-programme” introduced by the apartheid-regime in 1982, the “tricameral parliament”-programme, aimed at expressly entrenching in the constitution the complete exclusion of the largest part of the country’s population, the Africans, from citizenship and political power and co-opting parts of the population that had up to then also been marginalized, the “Coloureds” and the “Indians” into a government controlled by “Whites”. (SAIRR 1982, 1-28). DEUTSCHER EVANGELISCHER KIRCHENTAG DÜSSELDORF 1985, 551-554. Wolfram Kistner [1923-2006], Director of the Division for Justice and Reconciliation at the SACC [1976-1988], describes and criticizes in the light of biblical teachings the “tricameral parliament”-programme in his “Report on the Cluster Justice and Society” presented to the SACC-National Conference in June 1982. Kistner’s contribution had been discussed in various groups in the anti-apartheid solidarity-movement in West Germany, so also during the Kirchentag in Düsseldorf in 1985. The conference of the Alliance of Black Reformed Christians (ABRECSA) held in Cape Town in July 1984 had among others proposed that support be given to worker- and trade-union programmes, housing, bus boycotts, and committees for refugees as well as for the welfare of detainees. It also suggested that “rejection of the new South African constitution” should be demonstrated by “the withholding of communion” from persons who had voted in the coloured- and Indian-elections. (The Star 10 July 1984; SAIRR 1984, 910-911). The more than 200 delegates attending the SACC-conference  had spent considerable time on the question of population-removals. During a religious service that opened the proceedings, delegates recited aloud from a written text their pledge `to resist forced removals, to support those who resisted them, and to assist those who have suffered through them’. A resolution on the relocations was referred to the SACC’s division of justice and reconciliation for implementation and action. It called for a country-wide mobilization of Christians and supporters under church-leadership to gather at places where the removal of a community was threatened to show `sympathy, solidarity, and support and, if possible, through presence, prayer, and protest to prevent the removal´. (Race Relations Survey 1984, Johannesburg: South African Institute of Race Relations [SAIRR] 1985, ISBN 0-86982-307-8 (pp. 915-916). Controversial discussions centred on reports that the ANC had held a major consultative conference early in 1985 to review strategy and tactics – the first since the conference at Morogoro (Tanzania) in 1969 where major decisions about strategy were taken. Commentators said that issues on the agenda had included: whether conditions were ripe for the ANC to move into a phase of `peoples’ war´ where every one of its supporters engaged in political and military struggle; the extension of the ANC’s underground structures in South Africa; the formal status of white, Indian, and coloured members; and the role of workers in the Struggle. (Various reports; SAIRR 1984, 3). The ANC was reported to have allocated about $50m a year, half its budget, for its military wing, uMkhonto weSizwe (Spear of the Nation) in 1983. (Financial Mail 8 June 1984). In June  Sweden announced that it was contributing R6m to the ANC in humanitarian aid, while the World Council of Churches granted R117 000 to be used for `education, information, and publicity purposes´. (Rand Daily Mail 20 September 1984). It was reported in July that the British Labour Party’s leader, Mr Neil Kinnock, promised material support to the ANC. (The Star 23 July 1984). The ANC also received humanitarian aid from a range of non-governmental organisations including Oxfam, the United Church of Canada, various Roman Catholic aid-agencies, and Scandinavian charities. (The New York Review 2 February 1984; SAIRR 1984, 1). The then prime minister, Mr P W Botha, said during a trip to western Europe in May and June  that his government was prepared to talk to the ANC or any other organisation provided that it was `done constitutionally and not under the threat of violence´. The ANC discounted speculation that it would hold talks with the apartheid-government, however. (The Star 17 July 1984; SAIRR 1984, 2). The Invitation had gone by word of mouth – cell-phones and internet were not yet known those days. This reminded especially of the conference of the Alliance of Black Reformed Christians (ABRECSA) that had been held in Cape Town in July 1984 as well as of the more than 200 delegates to the annual national conference of the SACC, which had been held in Bosmont (Johannesburg) at the end of June  under the theme `The God of the Poor´, – delegates who had “recited aloud … their pledge `to resist forced removals, to support those who resisted them, and to assist those who have suffered through them’”. (SAIRR 1985, p. 916). The prayer: „Vater unser im Himmel … [Our Father in heaven …]“ according to Matthew 6:5-15. These included interest-groups like “Christen für Partnerschaft statt Gewalt” [“Christians for Partnership instead of Violence”], “Offensive Junger Christen” [=”Task-force of young Christians”], “Notgemeinschaft Kein Anderes Evangelium!” [=”Emergency-Society No Other Gospel!”] and the Deutsch-Südafrikanische Gesellschaft [German-South African Society]. They argued similarly to those opposing the boycott- and sanctions-campaign or the support of the Special Fund of the World Council of Churches [WCC] to Combat Racism on supposedly theological reasons. (See: Stelck, Edda: Stimmen gegen den Boykottaufruf [Voices against the Call to Boycott], in: Stelck. Politik. 53-66). When some insisted on `retaining´ common-ground with the average attendant of the Kirchentag by laying emphasis on “the Lord’s Prayer” and avoiding anything that might cause misunderstanding or irritation whatsoever, others sought to `bring about´ the desired consensus by appealing to and urging that apartheid be condemned unreservedly and solidarity be pledged convincingly with the peoples of South Africa and Namibia in their “Struggle” to end unjust rule. The former would be referred to as `conservative´, the latter `radical´. The conservatives argued in terms of the prevailing state of affairs in church and society, whereas the radicals opted for the perspective envisaged to replace the prevailing state of affairs in the given situation. “Senzeni na?” [= “What have we done? What crime had we committed?”], “Thuma mina!” [= “Send me!”], “Siph’ amandla, Nkosi!” [= “Give us strength, Lord!”], “Asikhathali noma s’yaboshwa …” [= “We don’t bother even when we would be detained …] and, of course, “Nkosi, sikelel’ iAfrika!” [= “Lord, bless Africa!”] were the most popular texts and tunes on the occasion. Her statement reminded of the SACC-conference  that had called for a country-wide mobilization of Christians and supporters to gather at places where the removal of a community was threatened and express their `solidarity, and support and, if possible, through presence, prayer, and protest to prevent the removal´. (SAIRR 1985, 915-916). I am so glad you sought praise and renewed recognition of Allan Boesak. Good on you! Your writings are excellent. Through me they get sent to many other people. I am pleased to have met such a resourceful and fascinating personality, Allan Boesak, who continues inspiring me especially by maintaining goodness amidst all adversities and challenges. Thank you for keeping good news going! vielen Dank! Du weckst viele Erinnerungen. Ich wollte, wir hätten heute eine so breite Bewegung für Gerechtigkeit in Palästina/Israel (vgl. http://www.radicalizing-reformation.com/index.php/de/publikationen/183-bd-7-religionen-fuer-gerechtigkeit-in-palaestina-israel.html).